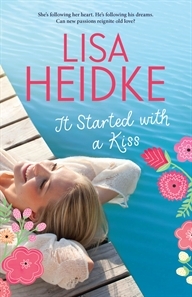 It occurred to me that I hardly need to introduce Lisa Heidke to followers of this blog, who I know are pretty passionate readers of contemporary women's fiction. Lisa is the popular author of LUCY SPRINGER GETS EVEN, WHAT KATE DID NEXT, CLAUDIA'S BIG BREAK and STELLA MAKES GOOD – books she is proud to call 'chick-lit'. Lisa and I met online – not the way you're thinking (you can read more about such things below) – but in the way many authors meet each other these days, via our social platforms. But we did eventually get to meet in person, and bonded over everything we had in common – especially our love of women's fiction and our struggles writing it! I discovered Lisa is as funny as her books, and I'm thrilled to welcome her to my blog today to discuss her long-awaited new novel, IT STARTED WITH A KISS. So, it’s been a while between drinks, Lisa! I have seen your fans on social media hounding you for your next book, so I’ll ask for them, what took you so long? Short answer? A couple of false starts … The longer answer? I wrote a manuscript that I love about two sisters on the professional tennis circuit. It’s got travel, romance, suspense, and intense drama between the siblings as they navigate their professional and private lives in the public arena. Unfortunately, [my publisher] Allen & Unwin, didn’t think it was quite the right fit for them so I started writing IT STARTED WITH A KISS. Coupled with my oldest son doing the HSC in 2013 and A&U pushing the publication date back, yes, you could say it’s been a long journey getting novel number five ‘out there’. But I am so pleased it is! So you’re saying you haven’t exactly been sitting on your hands. :) I think readers don’t always realise that the publishing process is often long and arduous, and completely out of the author’s control. Good for you for persevering and producing a whole brand new novel, which I enjoyed immensely! What was your inspiration, the spark that fired IT STARTED WITH A KISS? I have friends whose marriages and long term relationships have fallen apart and suddenly they find themselves alone and lonely. How do they meet people? Quite a few sign on to dating sites – RSVP, e-harmony etc. And I thought this would be a fascinating premise for a novel. I interviewed friends and am enthralled by the concept – how internet dating works (and often doesn’t! ), the successes and the horror stories. I also poked around a few dating websites … eye-opening. It’s amazing how much personal information people will reveal to complete strangers, along with sharing photos taken back in the 90s when they had a full head of hair and looked twenty-five. What happens if they make it as far as actually meeting up with their potential love interest? I had a great time writing IT STARTED WITH A KISS, but I wouldn’t like to be Friday! Why not? I'd certainly like to have her name - what a great name for a heroine! The grist of any good story! We writers are so mean to our poor characters. And yes, thrusting Friday into the realm of internet dating was particularly cruel. So tell us about your research – what’s your opinion of internet dating now? Inevitable. Is that the right word? Because if you’ve just come out of a long-term relationship and all your friends are couples, how do you meet potential partners, especially if you’re a stay-at-home mum, working alone or employed in a small business? If you’re actively involved in the church, gym or some other activity, such as a cycling or movie club, you might meet someone … but what are your other options? (Other than badgering your friends about ANY single non-loser friends, brothers, and acquaintances they might have.) Generally, older, single women aren’t going to go to bars or clubs by themselves; it’s far safer to flick through potential candidates on a computer in the privacy of your own home. Does that sound depressing? I don’t mean it to be – and I certainly didn’t set out to write about internet dating, but the more I spoke to women the more I realised that this was the norm, especially for woman between the ages of 25 and 45, who were looking companionship – at the very least. No, it doesn’t sound depressing, you sound like you’re a convert! You certainly cover the range of possibilities of internet dating – the good, the bad, and the ugly. But, without giving spoilers away, Friday’s biggest problems come from rather unexpected places. The twists and turns at the end of the book are surprising and even shocking at times, and really well-handled, Lisa. Congratulations! Thanks, Di. I had a lot of fun writing Friday’s story. I really hope she resonates with readers. Just one final point – my internet dating days are over but I have quite a few friends who have found true love on these sites! Lucky them! Thanks so much for your time, Lisa, it was great chatting.